A joint NSW Department of Primary Industries (DPI) and Local Land Services surveillance operation in the Riverina is helping protect the state’s $65 million lupin industry from anthracnose. NSW DPI pulse pathologist, Kurt Lindbeck, said lupin crops will be inspected to ensure the devastating disease is under control and help save growers an estimated $5.5 million in annual control costs. 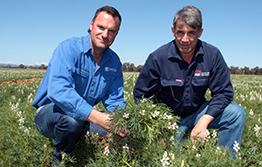 “Last year inspections of 100 NSW lupin crops found no evidence,” Dr Lindbeck said. 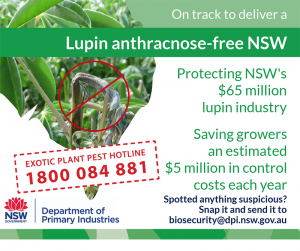 “This season’s surveillance is the third and final year of the operation to eradicate anthracnose from NSW following the 2016 outbreak, when the disease was found for the first time in NSW commercial lupin crops. NSW DPI advises producers purchasing stockfeed from Western and South Australia request a vendor declaration stating the feed does not contain lupin plant material, which is prohibited from entry into NSW due to the risk of introducing anthracnose. The surveillance operation is part of the eradication plan which was put in place in 2016, when six farms in the Cootamundra-Gundagai, Coolamon and Junee shires were confirmed to have anthracnose. The initial infection was isolated and controlled, and the three shires remain subject to restricted conditions under a biosecurity zone to control lupin anthracnose until the zone is declared free of the disease. Residents of these shires are not permitted to grow ornamental lupin plants. NSW DPI and LLS are continuing to work with growers, industry and the local community to ensure NSW remains free of the disease, supporting a profitable lupin industry with market access to domestic and export markets.